So you want a knife? You want to buy a friend a present and you are considering a knife as that gift. You walk into a knife store, walk up to the counter and tell the salesman, “I want to buy a knife for a friend.” At this point, the salesman starts asking you questions. Among the questions, what will the knife to be used for and how much do you want to spend? The hope is that, by the time you read this article, you will understand what questions to consider before entering the knife store, or as is so common today, where to start for an online search for the right knife. There are several considerations to be made with regard to use. The first is what will the knife be used for? Practically speaking, there is no knife that does everything. If that person is a hunter, are the conditions they hunt in dry (desert as in the American southwest), wet environments like in the swamps of Florida, or perhaps near saltwater such onboard fishing vessels. The environment the knife will be used in should shape the decision of the blade material; carbon steel, stainless steel, or one of the newer super steels. Will the recipient carry the knife in the office, in the mountains of Afghanistan, or in the North Carolina mountains? These variables might also shape the idea of fixed blade or folding knife. Carbon Steel is made from iron and a very small amount of carbon. Knives made with carbon steel range from basic pocket knives such as Case pocket knives to the Marines’ Ka-bar, as well as military bayonets. That brings us to stainless steel. Stainless steels are carbon steel with the addition of chromium and other alloys which results in a steel with greater levels of resistance to corrosion or rust. Stainless steel blades are commonly seen in fishing knives, skinning knives, survival knives, and kitchen knives. The next type of steel to be discussed is called super steels. I use the phrase super steel because today, knife users have the opportunity to choose from steels using advanced metallurgical processes, which make possible, knives with superior edge retention, stainless properties, as well as toughness. Knives made from these steels are folding knives, such as the Spyderco brand of folding knives, European knives such as Fallkniven Knives, and my personal favorite, Bark River Knives Bravo 1.5 (CPM-3V) distributed through DLT Trading. Super steels cost more but you get what you pay for. When selecting a knife, a primary consideration is the question of fixed or folding blade knife? 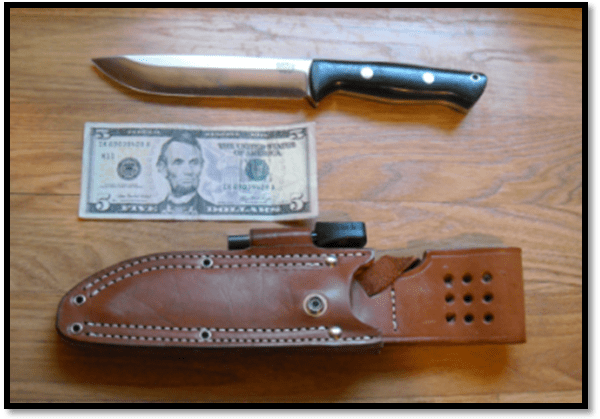 Fixed blade knives typically are carried in leather sheaths allowing the user to wear the knife on their waist or attached to other gear. Fixed blades do not fold and are generally stronger and safer than folding blades since the blade can’t fold back on the user’s fingers. Fixed blades vary in length from three inches to over a foot. Most people that carry fixed blade knives for everyday use prefer knives having blades of no more than 6 inches. I personally find blades larger than 6 inches useful for chopping wood and brush but unwieldy for chores around the camp fire or home. I wear a fixed blade knife almost daily. This knife is the Bark Rivers Bravo 1.5 knife distributed by DLT Trading. The blade length on the Bravo 1.5 is 5.8 inches (seen below). As the name implies, folding knives fold for easier and less conspicuous carry in a pocket. The knife pictured below is a Benchmade Griptilian. This knife is first rate and can be carried in the office or around town (where a fixed blade knife might not be appropriate). Knives with this design serve as a great utility knife, although it would be just as suitable to skin animals since the steel used in this knife is first rate (154CM hardened to 58-60 HRC). The blade is 3.44 inches in length. A consideration for folding blade knives is the quality of the locking mechanism. Some locking mechanism physically block the knife blade from closing while others might serve to hold the blade in place with pressure and a small slotted lock. Users DO NOT want the blades closing at the wrong time. The Griptilian seen below has a first rate locking mechanism. Buck folding knives have good locking mechanism while many Chinese copies of these American classics are sub-standard. There is not a blade designed to do all tasks equally. That being said, there are blade designs that allow knife users to use their knife for multiple tasks. Some blade types, such as the clip blade circled below as part of a Case pocket knife lend themselves more to general use, whittling, and other applications. The two smaller blades are the spear point (left) and sheep’s foot (right). This Case can been carried for generations and serves as a great all-around pocket knife that does not generally draw any negative fanfare when carried. Another blade type is the Bowie or type blade used for combat applications such as hard field or combat use, including knife fighting. These type blades may be sharpened on one side or some may be sharpened on both edges. Additionally, some of these knives might be seen with serrated blades and saw teeth on the back of the blade. The saw teeth on the blade might appear intimidating but the saw blade’s usefulness is over-rated. Likewise, the serrated edges are okay for some applications such as cutting ropes, but their general usefulness (and difficulty of re-sharpening) proves to be negative features for this knife feature. Although popular in Hollywood movies, large Bowie knives are generally better suited for combat applications or sitting on the mantle as a show-piece. The third type blade is a more common type seen used for general camping, chopping firewood, and the preparation of butchering animals. This blade has a squared spine and has a blade that extends all the way from the tip to the base of the handle. The knife seen below is the Bark River Bravo 1.5. The Bravo 1.5 has a normal straight back design. The Bravo 1.5’s straight back design would serve well for skinning animals or for heavy chopping. Knives of this design remain the most popular for avid outdoorsmen and weekend campers alike. In some states, cities or municipalities, it is legal to carry (or wear) a knife in public. For example in some rural communities of the south, most would not give a second glance at a person openly wearing a knife. However, if someone in New York City openly carried a knife, they might find themselves being arrested. Similarly, find out if local laws prohibit the carrying of folded knives. In some areas folding knives might be considered concealed weapons and thus illegal. Finally, the local laws may specify the legal length of knives which may be legally carried (open or concealed). The point is, understand the laws and regulations where the knife will be carried and ensure you are in compliance with local and state ordinances. Most salespersons in your local Wal-Mart will not know the laws on knives in your area. Do your research ahead of time and save yourself some hassle. Most of us are not rich and do not have endless budgets. Therefore, the actual costs of the knives seen in this article might be useful. Starting on the low end, the Case pocket knife can generally be purchased for forty dollars or so. The Griptilian folding knife seen costs about 90 dollars or so. As for the two fixed blade knives; the two Bark River knives costs between 165 and 200 dollars, although variants with different handles or blade materials can be purchased for less. At the end of the day, knives that will serve us a lifetime can be purchased for between 35 dollars and up. We briefly discussed several things to consider when buying a knife; type of steels, blade design, use, costs, and legal considerations. Enjoy your search for that right knife. Chances are DLT Trading will have the knife you need. Every person has a good knife for self-defense.